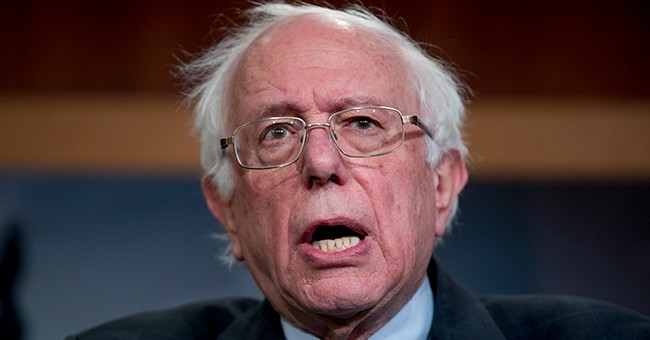 So, it’s come to this: ne of America’s major parties is in the grip of a crazy old communist – Bernie Sanders, 77 – and a crazy young communist – Alexandria Ocasio-Cortez, 29. This column is about the crazy old communist – Vermont Sen. Sanders, who just announced his candidacy for the presidency and raised $6 million. He prefers the less scary term Democratic Socialist. But his Marxist economics, Marxist cultural activism and well-documented support for communist causes—such as Fidel Castro’s revolution in Cuba -- speak volumes. Quicker than you can say Joe McCarthy this will be dismissed as another Red Scare. But even though truth is not much of a defense in this fake news era, let’s look at Sen. Sanders’s background, and you can make up your own mind. As Mayor of Burlington, Vermont in the 1980s, Mr. Sanders hung a Soviet flag in his office in honor of Burlington’s Soviet sister city, Yaroslavl, where he honeymooned in 1988 with his second wife, Jane O’Meara Sanders. In 1985, Mayor Sanders went to Nicaragua to celebrate the sixth anniversary of Daniel Ortega’s communist Sandinista regime and speak at an anti-American rally. He arranged for Burlington and Puerto Cabezas, Nicaragua to be sister cities, and also visited communist Cuba. As an admirer of crackdowns on pesky opposition media, Sen. Sanders in 2007 co-sponsored the Media Ownership Reform Act, which, among other things, would have reestablished the misnamed Fairness Doctrine in order to muzzle conservative talk radio. Government takeover of healthcare and drug companies; “free” college tuition; “free” childcare; confiscatory taxes on “the rich,” and much of Alexandria Ocasio-Cortez’s Green New Deal. That hare-brained scheme calls for a massive government expansion to do away with airplanes, the internal combustion engine, “farting cows” (thus, hamburgers), and all fossil fuels within 11 years. Don’t laugh; they’re serious.